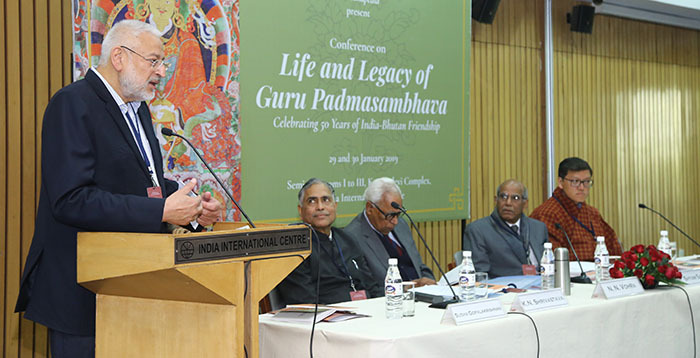 A conference on the Life And Legacy Of Guru Padmasambhava was organized by India International Centre, Centre for Escalation of Peace, and Sahapedia on 29-30 January 2019. The conference was slated as one of the events celebrating the 50 years of diplomatic relations between India and Bhutan. 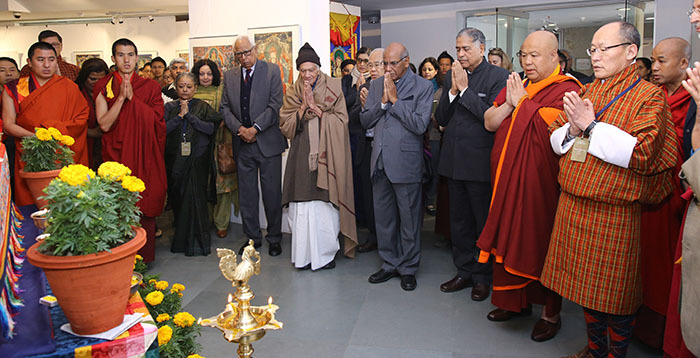 The conference and an accompanying exhibition of rare and precious thangkas, paintings, sculptures and photographs were held at India International Centre. At the inaugural session, speakers extended their appreciation for the vision and efforts of the three organizations in conceptualizing and planning the event. 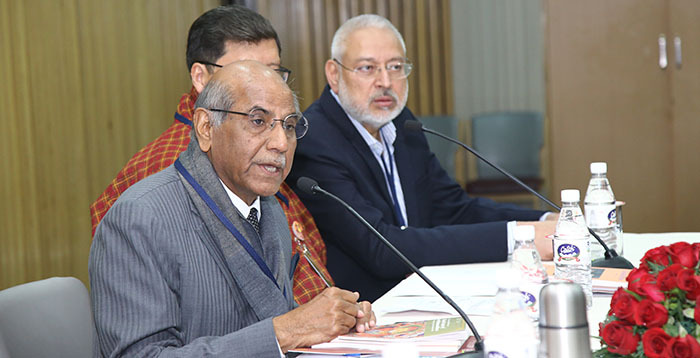 In his address, Mr. Arun Kapur contextualized the extensive impact of Guru Rinpoche on the evolution of spiritualism and culture of the trans-Himalayan region. He also emphasized on the importance of studying the great Guru’s universal message and finding connections in our current context. 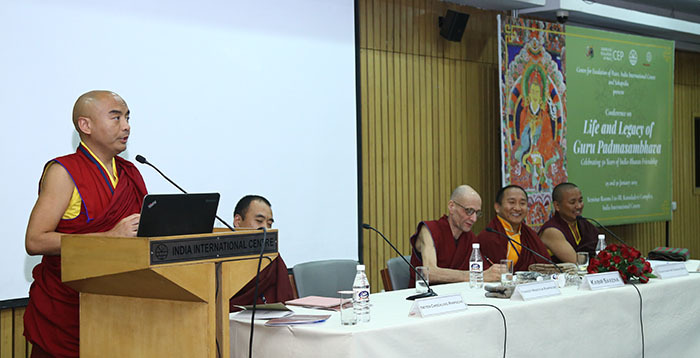 In his keynote address, Dasho Karma Ura skillfully traced the journey of tantric Buddhism northwards from the Indian plains, as well as the process by which it took root in the trans-Himalayan region. 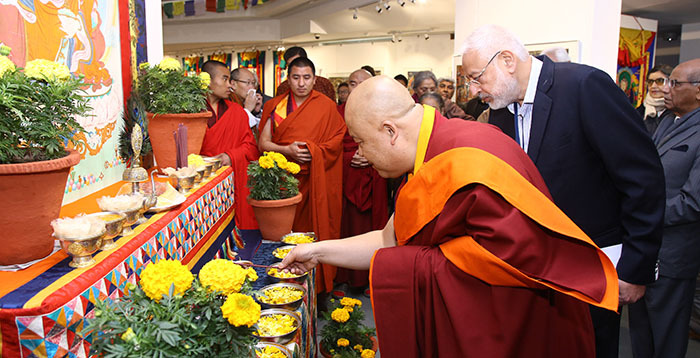 He also outlined the impact of Buddhism on religious and philosophical teachings in the region, and the lasting lexicological impact of translations from Sanskrit to Tibetan on language and grammar. Then, the keynote speaker gave the audience an exposition of hidden lands, terma literature and tertons and their relevance in reviving Buddhism, even under the very different conditions that apply across the world today. 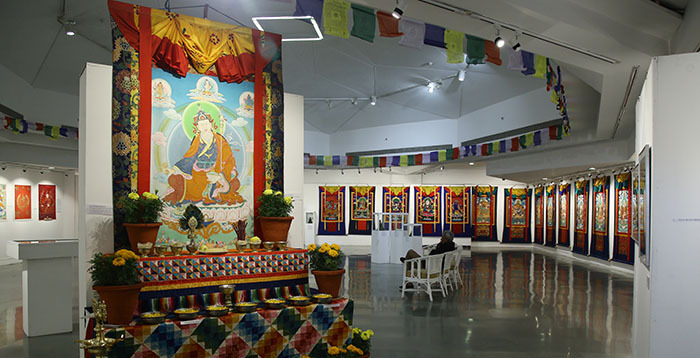 The conference was conducted through various thematic sessions dealing with various aspects of Guru’s life, such as Life and Teachings, Local Contexts, Texts and Commentaries, Iconography, and Rituals and Mandala Drawings. 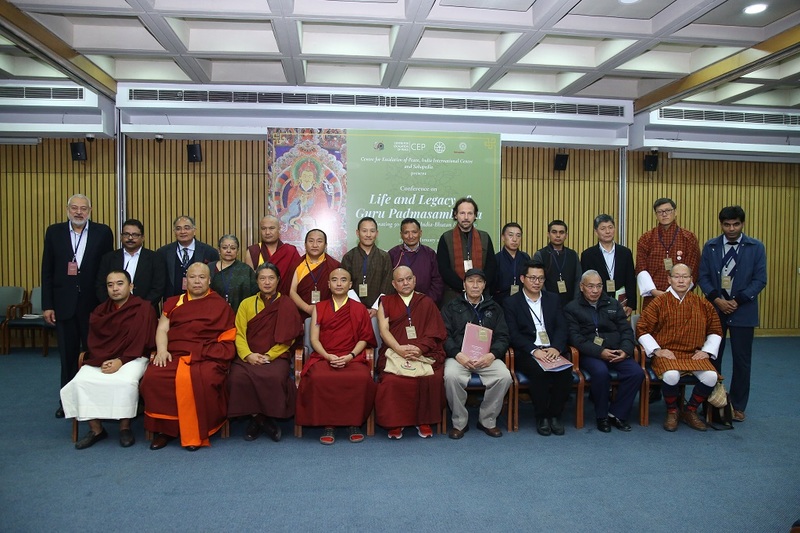 The thoughtful and textured discussions in these sessions benefited from the important contributions of the high Lamas and eminent practitioners. These included Neten Chockling Rinpoche, Yongey Mingyur Rinpoche, Hungtrampa Sey Namkha Dorje, Khenpo Pema, Gyetrul Jigme Rinpoche and Khenpo Lobsang Tsultrim Bhutia. The conference also benefited greatly from the papers presented by academics and experts on various facets of the life and work of Guru Padmasambhava. This included the scholarly works of Shri Lokesh Chandra, Thupten Tenzing, Nawang Tsering Shakspo, Ian Baker, Wangchuk Dorjee Negi, Lobzang Tsewang, Tsering Norboo Martse & Tashi Morup, Tashi Lhendup, Karma Phuntsho and Pranshu Samdarshi. 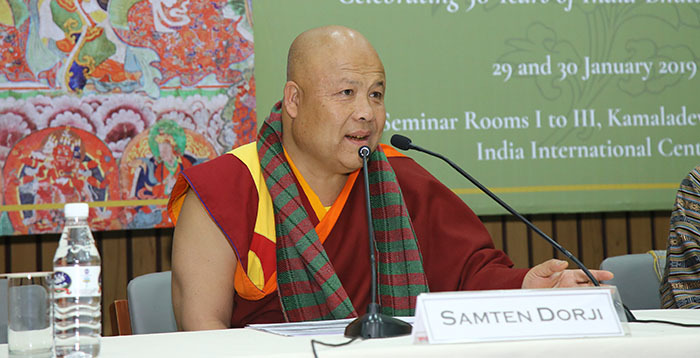 The valedictory address was delivered by the Most Venerable Samten Dorji. 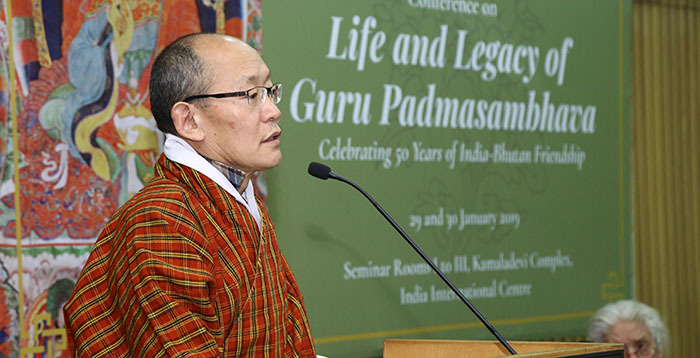 He explained the form and legacy of Guru Rinpoche as a Nirmankaya manifestation, and emphasized on how the Guru’s teachings continue to shape the sensibilities and philosophy of the trans-Himalayan region, especially Bhutan. The concluding message emanating from the conference was that the Guru Rinpoche and his work remain timeless. Indeed, the universality of the Guru’s message makes his teachings particularly relevant for the world we live in today. The organizers and audience were particularly grateful to the Royal Bhutanese Embassy, for their generous support of the conference and for organizing a spectacular dinner featuring authentic Bhutanese cuisine.